Step 1: Post images/videos of your very own TajinMoments on Facebook, Instagram, and/or Twitter. Step 2: Use hashtag #TajinMoments and tag @TajinUSA on your posts! You can participate as many times as you want. Post between April 8th – July 15th 2019 to PARTICIPATE FOR A CHANCE TO win 1 of 3 Grand Prizes and/or a bi-weekly Tajin Giftbox with a $50 Amazon Giftcard! Grand prize winners will be chosen on July 15th 2019. NO PURCHASE NECESSARY TO ENTER OR WIN. MUST BE 18 YEARS OF AGE OR OLDER TO PARTICIPATE. MAKING A PURCHASE WILL NOT IMPROVE YOUR CHANCES OF WINNING. VOID WHERE PROHIBITED BY LAW. The Share Your #TajinMoments Contest (the “Contest”) begins at 12:00 PM Eastern Time (“ET”) on April 8, 2019 and ends at 11:59 PM ET on JulY 15, 2019 (the “Contest Period”). Each entrant (the “Participant”) unconditionally accepts and agrees to comply with and abide by these Official Rules and the decisions of Tajín International Corporation (the "Sponsor") which shall be final and binding in all respects. 1 The Contest Period from April 8th to July 15th 2019. April 26th, May 10th, May 24th, June 14th, June 28th, and July 12th for 6 winners, 1 on each date winning one winning (1) Tajin gift box and one (1) $50 USD Amazon Gift Card. Sponsor’s (as defined below) computer is the official time-keeping device for the Contest. 1. Eligibility: Contest is open only to legal residents of the fifty (50) United States and the District of Columbia who are 18 years of age or older at the time of entry (“Contestants”). A Contestant is sometimes referred to as “You” in these Official Rules. Individuals who are employees, officers or directors of TAJIN International Corp. (“Sponsor”), and their respective parents, subsidiaries, affiliates and advertising and promotion agencies, and the immediate family members (spouses, domestic partners and parents, children and siblings and their spouses or domestic partners, regardless of where they live) or members of the same households (whether related or not) of such individuals are not eligible to enter or win. The contest is subject to all applicable federal, state, and local rules that apply. Use of any automated system to participate is prohibited and will result in disqualification. All Entries have an equal chance of winning. By entering, You (i) represent and warrant that (A) You are of legal age or 18 years old or older; You grant the rights granted hereunder; (ii) You have fully and completely complied with these Official Rules; (iii) You grant permission, without limitation, for Sponsor and its affiliates to display in any media, now known or hereafter devised (including, without limitation, online on Sponsor’s websites and social media pages, on print materials, and on television) your name as submitted in the Contest, as part of the Contest, and in Sponsor’s advertising and marketing, without notice or compensation to, or additional permission from, You (as more fully described in Section 8 below.). By participating in this Contest, Contestant warrants and represents that he/she and any persons appearing or who are identifiable in the Entry consent to the submission and use of the Entry in the Contest and to its use as otherwise set forth herein. By participating in this Contest, you agree that your participation conforms to these Official Rules and that Sponsor, in its sole discretion, may disqualify Your Entry for any reason, including if it determines, in its sole discretion, that Your Entry fails to conform to these Official Rules in any way or otherwise contains unacceptable content as determined by Sponsor, in its sole discretion. By participating in this Contest, Contestant hereby grants permission for his/her name to be posted on Sponsor’s Page on Facebook, Twitter, Instagram or other websites and used in Sponsor’s advertising and marketing (as more fully described in Section 7 below). Contestant agrees that Released Parties (as defined below) are not responsible for any unauthorized use of Entries by third parties. Released Parties do not guarantee the posting or use of any Entry and may take down any Entry at any time and for any reason, in its sole discretion. 3. Voting & Winner Selection: Nine (9) Share Your #TajinMoments winners will be selected randomly by the promoter during the Contest Period, who will choose the nine (9) winners from all entries submitted. Sponsor will determine which of the Entries will be deemed winners to be determined in Sponsor’s sole discretion. Decisions of the Sponsor are final and binding in all matters. *Prize: There will be a total of nine (9) prizes, consisting of (1) one iPad Pro, (1) KitchenAid Artisan Series 5 Quart Tilt-Head Stand Mixer, (1)Mr. Drive In – Home Theater Projector, and six (6) Tajin gift boxes with a $50 Amazon Gift Card each accompanied with a variety of Tajín products . The ARV of grand prizes is: $1,400.00. Total ARV of all prizes: $1,800.00. Prizes and the redemption thereof are subject to terms and conditions specified by the issuer. Prizes are awarded “as is” with no warranty or guarantee, either express or implied. Prizes are not transferable and must be accepted as awarded. Winner may not request cash or other substitution; however, the Sponsor reserves the right to substitute a prize (or portion thereof) with another prize of comparable or greater value, in its sole discretion. All prize details will be determined by Sponsor in its sole discretion. Only one (1) Prize is permitted per person and per family or household. All taxes on prizes and all costs and expenses related to acceptance and use of the prize not specified in these Official Rules as being provided are the sole responsibility of winners. All prize details are at Sponsor’s sole discretion. With respect to winners, all Winners must comply with all rules and regulations of the contest, as applicable. Failure to do so may result in forfeiture of all or part of the prize. ODDS: Odds of winning depend on the number of eligible Entries received during the Promotion Period. During the Contest Period April 08, 2019 – JulY 15, 2019 For All prizes winners will be selected within 1-2 days of Winner Selection date. On/about the corresponding Notification Date, (i) for each potential winner Sponsor will send a private message in response to the entry notifying the potential winner that they have 72 hours to contact and reply to the Sponsor at the Webpage/platform using the Contact Form/Contact method provided in such Notification. If Sponsor, using commercially reasonable efforts, is unable to contact a potential winner within 72 hours from the first contact attempt, a prize or prize notification is returned as undeliverable or if a potential winner has not, or does not, comply with these Official Rules, then such potential winner shall be disqualified and, at Sponsor’s discretion, a runner-up may be notified for the prize at issue. The prize will be awarded within approximately 10 days after the winner is verified. 6. Grant of Rights: By participating in this Contest, You agree that You shall grant Sponsor and its licensees an non-exclusive, royalty-free, fully paid-up license to the reproduction and use of the Entry (including any photographs or videos and all rights embodied therein) for any purpose whatsoever without compensation or further permission from, or notification to, You, including, but not limited to, an irrevocable, perpetual, worldwide right, in any and all media (now known or later developed) to assign, use, publish, edit, adapt, modify, alter, reproduce, distribute, broadcast, display, create derivative works or otherwise exploit Entries, including the names and likenesses embodied therein, for commercial or non-commercial use, including, but not limited to, in advertising produced by Sponsor. You further agree to execute any specific consent needed or requested by Sponsor or its licensees in furtherance of such use. 7. General Conditions: By participating in this Contest, You agree: (a) to these Official Rules and decisions of Sponsor, which shall be final and binding in all respects relating to the Contest; and (b) to release, waive, discharge, indemnify, defend and hold harmless Sponsor, Facebook, Instagram, Twitter and their respective parents, affiliates, subsidiaries and advertising and promotion agencies and all of their respective officers, directors, shareholders, partnership, members, principals, employees, agents, contractors or suppliers (collectively, “Released Parties”) from any and all injuries, liability, losses and damages of any kind arising out of or related to their participation in the Contest or their acceptance, use or misuse of a prize including, without limitation, personal injury, death and property damage, and claims based on publicity rights, copyright, trademark, defamation or invasion of privacy. CAUTION: ANY ATTEMPT BY ANY INDIVIDUAL TO DELIBERATELY DAMAGE ANY WEBSITE OR UNDERMINE THE LEGITIMATE OPERATION OF THE CONTEST MAY BE A VIOLATION OF CRIMINAL AND CIVIL LAWS AND SHOULD SUCH AN ATTEMPT BE MADE, SPONSOR RESERVES THE RIGHT TO SEEK DAMAGES AND OTHER REMEDIES (INCLUDING ATTORNEYS’ FEES) FROM ANY SUCH PERSON TO THE FULLEST EXTENT PERMITTED BY LAW. DISQUALIFICATION: It is the Participant's responsibility to ensure compliance in all respects with these Official Rules. Sponsor reserves the right in its sole discretion to prohibit a Participant from participating in the Promotion or winning a prize if, in its sole discretion, it determines that said Participant is attempting to undermine the legitimate operation of this Promotion, including without limitation by actually or attempting to: tamper with the entry processes or the operation of the Promotion; act in violation of these Official Rules; act in an unsportsmanlike or disruptive manner, or with the intent to disrupt or undermine the legitimate operation of the Promotion, or to annoy, abuse, threaten or harass any other person. Sponsor reserves the right to seek damages and other remedies from any such person to the fullest extent permitted by law. FORCE MAJEURE: Sponsor reserves the right, without prior notice and at any time, to terminate the Promotion, in whole or in part, or modify or suspend the Promotion in any way, if it determines, in its sole discretion, that the Promotion is technically impaired or corrupted or that fraud or technical problems, failures or malfunctions have destroyed or severely undermined the integrity and/or feasibility of the Promotion. In the event Sponsor is prevented from continuing with the Promotion as contemplated herein by any event beyond its reasonable control, including but not limited to fire, flood, natural or man-made epidemic of health or other means, earthquake, explosion, labor dispute or strike, act of God or public enemy, satellite or equipment failure, riot or civil disturbance, terrorist threat or activity, war (declared or undeclared) or any federal, state or local government law, order, or regulation, public health crisis, order of any court or jurisdiction, or other cause not reasonably within Sponsor's control, then subject to any governmental approval which may be required, Sponsor shall have the right to modify, suspend, or terminate the Promotion. If the Promotion is terminated, in whole or in part, before the designated end date, Sponsor reserves the right to select the winners from among all eligible, non-suspect Entries received as of the date/time of the event giving rise to the termination. Only the type and quantity of prizes described in these Official Rules will be awarded. INVALIDITY: These Official Rules cannot be modified or amended in any way except in a written document issued in accordance with law by a duly authorized representative of Sponsor. The invalidity or unenforceability of any provision of these Official Rules shall not affect the validity or enforceability of any other provision. In the event that any provision is determined to be invalid or otherwise unenforceable or illegal, these Official Rules shall otherwise remain in effect and shall be construed in accordance with their terms as if the invalid or illegal provision were not contained herein. In the event there is a discrepancy or inconsistency between disclosures or other statements contained in any Promotion materials and the terms and conditions of these Official Rules, these Official Rules shall prevail, govern and control. GOVERNING LAW: All issues and questions concerning the construction, validity, interpretation and enforceability of these Official Rules or the rights and obligations of the Participant and/or Sponsor in connection with the Promotion shall be governed by and construed in accordance with the internal laws of the State of Texas without giving effect to any choice of law or conflict of law rules or provisions that would cause the application of any other state's laws. By participating in this Promotion, Participants agree that Texas courts shall have jurisdiction over any dispute or litigation arising from or relating to this Promotion and that venue shall be only in Houston, Texas. Any such controversy or claim shall be litigated on an individual basis, and shall not be consolidated with any claim or controversy of any other party. The remedy for any claim shall be limited to actual damages, and in no event shall any party be entitled to recover punitive, exemplary, consequential, or incidental damages, including attorney’s fees or other such related costs of bringing a claim, or to rescind this agreement or seek injunctive or any other equitable relief. 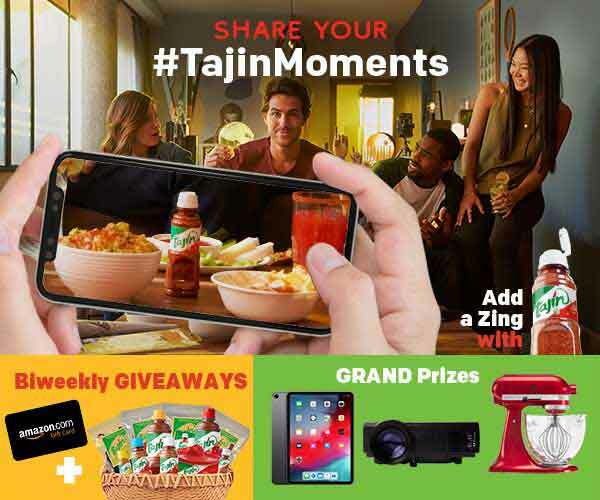 Winner’s List: To receive the winners’ names, mail a self-addressed, stamped envelope to Share Your #TajinMoments Contest to be received after July15th , 2019 to: Tajin International Corporation, 3934 Cypress Creek Pkwy ste. 201, Houston, Tx. 77068. OFFICIAL RULES: To receive a copy of these Official Rules visit www.tajin.com or mail a self-addressed stamped envelope to Share Your #TajinMoments Contest Rules Request to Tajin International Corporation, 3934 Cypress Creek Pkwy ste. 201, Houston, Tx. 77068. Official Rules Request must be received by July 15th, 2019. Sweepstakes Administrator: Tajin International Corporation, 3934 Cypress Creek Pkwy ste. 201, Houston, Tx. 77068. Sponsor: Tajin International Corporation, 3934 Cypress Creek Pkwy ste. 201, Houston, Tx. 77068. The Campaign hosted by Tajin International Corp. is in no way sponsored, endorsed, administered by, or associated with Facebook, Instagram, Twitter or Amazon. This contest is solely sponsored, endorsed and administered by Tajin International Corp. You understand that you are providing your information to Sponsor. If you have any questions about this Contest, please contact Sponsor at the aforementioned address or via contact@tajin.com. Void outside the U.S. and wherever else prohibited. © 2019 TAJIN International Corp. All rights reserved. This is the web site of TAJÍN International Corp. (we or us). Thank you for visiting tajin.com. The following is a description of how we collect, store and use your information across any of the websites operated by TAJÍN®. Empresas TAJÍN, S.A. de C.V.
For each visitor to our Web page, our Web server automatically recognizes the consumer's domain name and e-mail address (where possible). We may also collect information about the services that you use and how you use them, like when you visit different parts of our site or applications and what selections you make on the services. And we may collect device-specific information (such as your hardware model, operating system version, unique device identifiers, and mobile information if you use a mobile device to access the site). Tajin.com is registered with the Exact Target email and user data collection services. In addition to the above, we collect information you provide to us. For example, we collect the e-mail addresses of those who post messages to our bulletin board, the e-mail addresses of those who communicate with us via e-mail or register for more information on TAJÍN® products and promotions, and other information volunteered by the consumer, such as survey information and/or site registrations, which may include, in addition to your email address, your name and address, telephone number, fax number. The information we collect upon your consent is usually used for internal review, used to improve the content of our Web page, used to customize the content and/or layout of our page for each individual visitor, shared with agents or contractors who assist in providing support for our internal operations, used by us to reach consumers for marketing purposes and used by us in the formation and development of marketing materials for newsletters specific to an event, product; sweepstakes, contest, or other promotions; surveys and polls; tell-a-friend messaging; information submitted for business relationship (e.g. résumés, export orders). The types of information collected for the features listed above will vary depending on the marketing activity. If you supply us with your postal address on-line you may receive periodic mailings from us with information on new products and services, samples, marketing give-a-ways or information on upcoming events. If you do not wish to receive such mailings, please let us know by sending us an e-mail to contacto@tajin.com. Persons who supply us with their telephone numbers on-line may receive telephone contact from us with information regarding new products and services, upcoming events or brand news/announcements. If you do not wish to receive such telephone communication, please let us know by sending us an e-mail to contacto@tajin.com. Some web browsers have settings that include do not track signals. Our services are not currently engineered to respond to those signals from browsers. Upon request we provide site visitors with access to unique identifier information (e.g., customer number or password) that we maintain about them, communications that the consumer/visitor has directed to our site (e.g., e-mails, customer inquiries) and contact information (e.g., name, address, phone number) that we maintain about them. You can access this information by sending us an e-mail to contacto@tajin.com. Upon request we offer visitors the ability to have inaccuracies corrected in contact information, unique identifiers, communications that the consumer/visitor has directed to the site. You can have this information corrected by sending us an e-mail to contacto@tajin.com. We have appropriate security measures in place in our physical facilities to protect against the loss, misuse or alteration of information that we have collected from you at our site, however no website is entirely secure. You should protect the account information in your possession as well. Our site is not directed toward children under 13 and we will not knowingly collect information for any child under the age of 13. If you are the parent of a child under the age of 13 and have a concern regarding your child’s information on our site, please contact us at contacto@tajin.com.